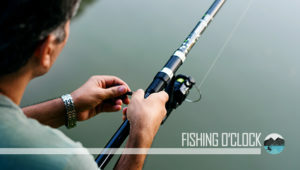 Fishing should be fun, and this can be achieved if you get the right equipment. People used a simple line a hook in the past, but now accessories and tools have become sophisticated. It has made fishing more enjoyable and easier. Still choosing between a baitcaster vs spinning reel has raised debates. Have you gone to one of those large outdoor stores? 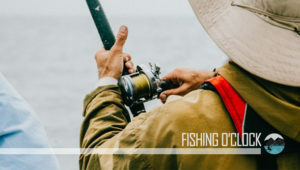 These stores are paradise for anglers because there is everything you might need, including fishing tools, rods, lures and any other accessory you will need. With a lot of options available, picking the right tool can be overwhelming, especially if you are searching for a reel. First things first, you should decide whether you want a spinning or baitcasting reel. These two common reels cover most of the fisherman’s needs and both have their advantages and disadvantages. We will talk about the benefits of using one reel over the other, and clear up all the questions you may have. The baitcasting reel, also known as a conventional reel, has been around for a while. 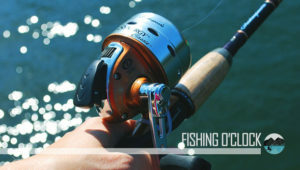 This reel is considered advanced and it is used by experienced fishermen. Most experienced anglers prefer baitcasting reels because of the control and sheer degree of precision these reels offer. The spool moves as you cast. Therefore, these reels demand a level of skill to produce the right power of inertia required to move the spool. Experienced anglers need to do a lot of exercises to get the hang of using baitcast reels. Baitcasting reels provide anglers the durability and strength they cannot get from other reels. Its spool is capable of withstanding heavier line required in catching big fish. Just like any other reel, baitcasting reel has situations where it is the best option. For instance, when using heavier lures and lines, the baitcast reel provide greater accuracy and control than other options. In a situation where you need control, like an ability to slow down the bait, it is achievable with a baitcast reel. Other anglers choose baitcast reel because they want a challenge of learning to cast the line in a proper manner. Baitcasting reels are more durable and suitable for harsh weather conditions. It is designed to withstand a battle between a fish and man. With additional drag pressure, anglers can battle fish for a long time. Due to its accuracy, baitcasters are popular for saltwater fishing. 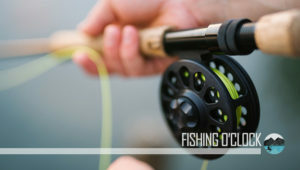 Nearly all anglers have used a spinning reel. This reel is an excellent option for finesse catching crappie, bass, redfish and other small to medium-sized fish. It comes with a fixed spool below the rod. You need to use the weight of bait, lure, and tackle to pull out the line. A crucial part when it comes to picking the right reel is ensuring that you have the right tools for the job. When using a line less than 10 pounds, the spinning tool is the best option. It is recommended to use spinning reels when fishing with lighter lures or lighter lines and for a right reason. When fishing with a line below 10 pounds, a limber rod that flexes and bend is required. Otherwise, you might break your line when you catch a bite. When a baitcast rod flexes, the line will rub against the rod blank. Repeated rubbing will make the line to develop a weak spot and then break. Since the guides are below the rod in a spinning reel, the rod can flex as needed and the line cannot touch the rod. Also, spinning reels are the best option when it comes to lighter lures since the lure will only pull the weight of the line and not the entire spool. The reels weight doesn’t rest on the rod, making it easy to hold and control. It allows more accuracy and is suited for small areas. It is suitable for freshwater fishing. When compared to baitcasters, this reel is easier to cast and anglers can cast under trees and above plants in the water. The baitcasting reel is ideal for intermediate and experienced anglers who are looking for more accuracy and who want to catch bigger fish. This reel differs from classic design in that the casting functionality works. Anglers are required to push down their thumb for the spool to be released instead of closing and opening the bail. However, a spinning reel requires one to pay attention to the drag. It is best suited for intermediate and beginner anglers who prefer freshwater fishing. You should press the thumb down at the apex doe the line and gear to be released. Without proper timing of the movement, the cast will be where you don’t want it to be. 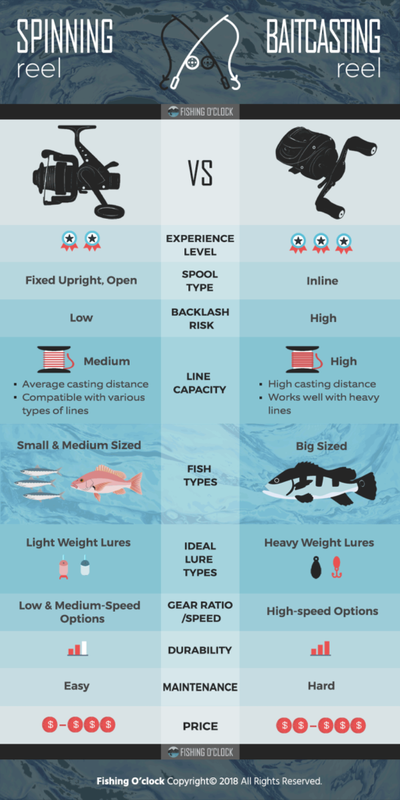 Hopefully, this guide has pointed out all the differences between baitcaster and spinning reels. You need the right reel for the right job.